��A Cajun Chess Exclusive! Now Available! The perfect T-shirt for all Chess players, or for any competitive sport. 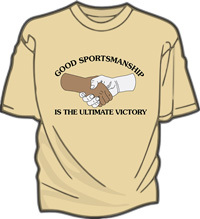 It features two Cartoon Hands, one white and one black, and reads "Goods Sportsmanship is the Ultimate Victory"